The Sol Group, the leading energy provider in the Caribbean, is happy to introduce the Sol Excellence Customer Feedback Programme across its extensive regional network. This programme aims to create and maintain a thriving customer service culture at its service stations. Throughout its duration, customers will be able to share their insights and feedback. Combined with elements such as Customer Appreciation Days, the programme promises to be a very rewarding one for the Sol brand, its customers, employees and all other Sol stakeholders. “We are excited to introduce the Sol Excellence Feedback Programme to our customers,” said Retail Programmes Manager of Sol Caribbean Ltd., Gale Weithers. 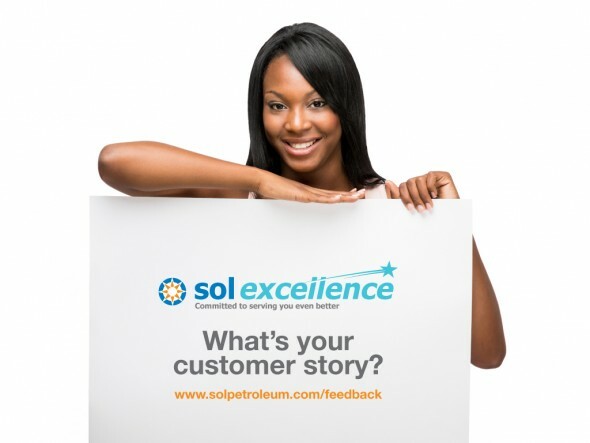 Customers are encouraged to visit www.solpetroleum.com/feedback to let Sol know about ther experiences at their service stations. “This feedback will help us ensure that we create and maintain a culture of service excellence and will allow us to deliver amazing experiences to our customers,” said Weithers. The Sol Excellence Customer Feedback Programme is a component of the petroleum company’s comprehensive operational excellence programme. Other focus areas of Sol Excellence include employee interactions and Health, Safety and Environment (HSE) standards, which aim to fulfil the petroleum company’s mandate to be a sound, safe and viable business. The Caribbean owned company is currently celebrating ten years of providing customised energy solutions to individuals, families, businesses and government organisations throughout the region.